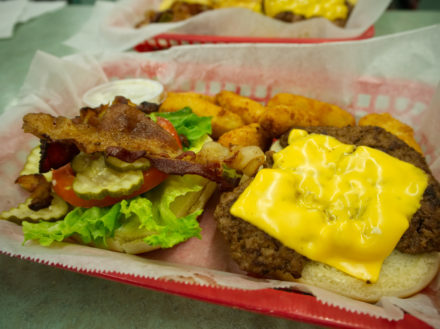 You don’t go to Sutton’s Drug Store to get a prescription filled, unless your prescription is for a classic cheeseburger, lunch counter sandwich or milkshake. In that case, you’ve come to the right place. 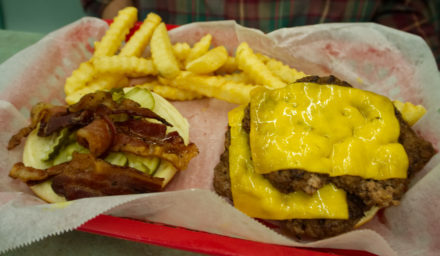 There are a lot of burger places these days that trade on nostalgia for a time that never was, with bright colors, Elvis memorabilia and jukeboxes playing Chuck Berry and Bobby Darin. Sutton’s is the real thing. The drug store has been a Chapel Hill mainstay since 1923 and goes back to the days when pharmacies had soda jerks in white lab coats and served a reasonably priced breakfast or lunch to the downtown crowd. But Sutton’s is not a museum or a Disneyfied version of the past, just a small-town lunch counter (the pharmacy business was sold to CVS a couple of years back) that has managed to stay afloat in chain driven America. That, in and of itself, is pretty wonderful. I’ll take a bacon cheeseburger. Light on mayo. Heavy on nostalgia. Does Sutton’s offer the best burger in the world? No. Not even the best burger in Chapel Hill, which these days boasts Al’s Burger Shack, Buns, and Top This within walking distance. What it does offer, however, is an experience that is worth seeking out and sharing, at least once.